Ragazzini produces high quality, flexible hose, positive displacement pumps, also called hose pumps. Positive displacement pumps with a flexible hose are ideal for pumping low to very high viscous liquids, with or without solids. Some key features of positive displacement pumps are: they can create a high vacuum of over - 0.9 bar, they are dry self-priming, have no dry running limits, no mechanical seal, their rotation is reversible and they have a fixed capacity per rotation, which makes them ideal for dosing purposes and for handling shear-sensitive liquids. Ragazzini pumps are well-known for their robust construction of rollers with roller bearings on the hose reels which minimize the friction created when the hose is reeled. 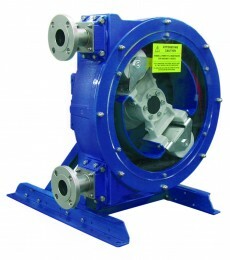 Unlike a lot of hose pumps which have sliding shoes, a Ragazzini pump is simply dry so that the product you are pumping cannot be polluted by a hose rupture. Replacing a hose is easier too, as a hose rupture can be quickly detected by using a leak detector. For filter press applications, Ragazzini produces high-pressure positive displacement pumps with a flexible hose that can deliver a pressure of up to 15 bar; these pumps are usually supplied with a pressure transducer and a frequency control. Bedu Pumps specialises in repairing overhauling and maintaining Ragazzini positive displacement pumps with a flexible hose.